The EB-5 program's mission as a catalyst for job creation is the driving force behind its value to the American people: each EB-5 investor must create 10 jobs. Those in the EB-5 industry deal with the numbers of EB-5 job creation on a daily basis. All too often, the people, stories, and faces behind those numbers are overlooked. We had the privilege of interviewing 10 individuals employed by 10 different EB-5 projects set up by 10 different regional centers. The number 10, of course, reflects the number of jobs that each EB-5 investor must create. The investors who immigrate through EB-5 are participating in more than an investment program, more than an immigration program - they are crafting a legacy. Read the following stories with the understanding that each EB-5 investor has an impact on at least as many lives and stories as the following 10 people. Each EB-5 investor participates in the most quintessential of all American legacies: the pursuit of the American Dream. After her family was displaced by Hurricane Katrina in 2005, Nikeia Scott moved around the South, working a series of “odd-jobs,” as she calls them. A few years after the hurricane, her two sisters moved to the Lancaster, Tex. area. She did not see them again until 2009, when she moved there herself. 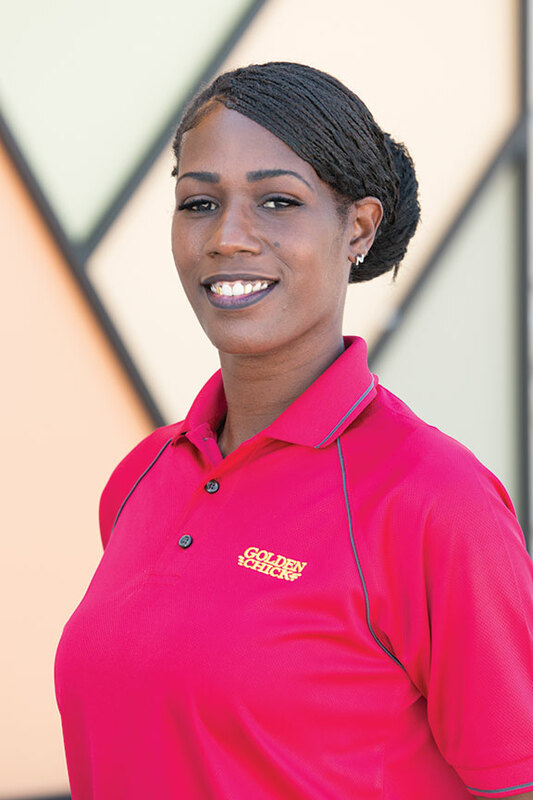 And it is her current job at Lancaster’s newly opened Golden Chick restaurant that gives her the family-friendly schedule and weekends off to do just that. After working her “odd-jobs,” which included managing a warehouse and selling life insurance, she sought out this specific job even before the restaurant opened for business. Starting from the beginning is exactly what Scott did. She was hired as a cashier, but three months later she was promoted to shift leader. She noted that she feels she is on the path to further her career in this new position. “With being promoted to shift manager, I see that there is room for growth here, and I know that I will be rewarded according to my work,” Scott said. That room for growth was important to her, and it has been her whole life. Scott said that she always strives to be “above average” in everything she does, and she knows where that drive to succeed can take her. Not wanting to take all the credit herself, Scott said her success is a reflection of her customers’ satisfaction. That sense of being so close with her community goes a long way with the people Scott interacts with. Deep inside Milwaukee’s historic Walker’s Point neighborhood, near the confluence of the Milwaukee, Menomonee, and Kinnickinnic rivers, sits the Global Water Center. The seven-story building is the physical manifestation of the Water Council, a regional non-profit that drives economic growth in the city’s budding “blue tech” industry. Isaiah Perez has seen the effects of that growth first-hand. Perez is a Milwaukee native that grew up in Walker’s Point and attended the University of Wisconsin, Milwaukee. Perez is the member services and development coordinator for the Water Council. He joined the Water Council as an intern before the center officially opened in 2013, and was hired full-time shortly after. 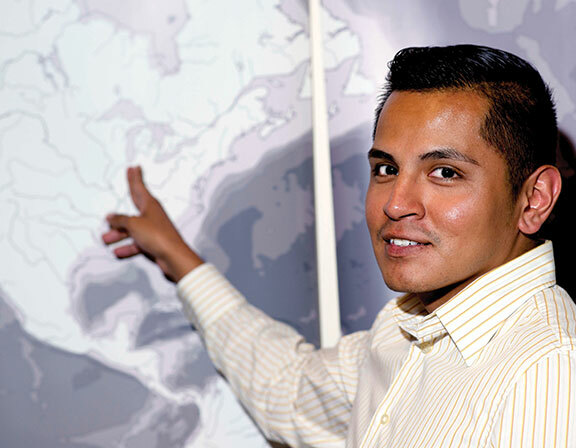 As a Milwaukee native, Perez knew that he wanted to get involved with the Global Water Center early on to help facilitate growth within the industry. After graduating from UWM, he interned at a marketing company. As that internship was coming to a close, he had expressed interest about the Water Council to one of his supervisors. The next thing he knew, he was introduced to several people at the Water Council. Perez said his position allows him to connect with his community in special and organic ways. His job also affords benefits that he did not expect so early in his career - like paying off student loans and purchasing a home. Even though the blue technology industry is growing because of the Milwaukee’s deep water-related roots, there are still many people in the city that are unaware of what is going on. “Educating people about what is going on in the water industry here in Milwaukee is the most fulfilling thing,” Perez said. Recent redevelopment of the Walker’s Point area has driven an economic resurgence for southeastern Milwaukee, Perez said, though the outlook for the neighborhood was not always this positive. For Perez, being a part of that growth in his hometown has been a life-changing experience. For some people, their passion leads them to a specific job. For others, like Cathleen O’Higgins, however, her job led her to discover a passion. O’Higgins is the health, safety, and environmental coordinator at Dakota Spirit AgEnergy, a company in the ethanol industry. In this position, she works to ensure the safety of the employees and the workers. 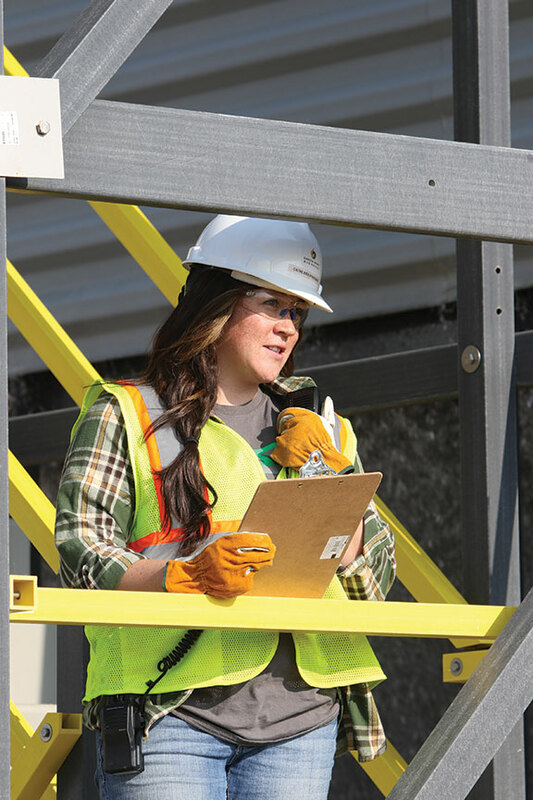 On the environmental side, she oversees compliance with OSHA and the EPA. “I have a degree in exercise science, and I kind of fell into health and safety when I moved to Jamestown,” said O’Higgins, who is currently pursuing a master’s degree in personal hygiene. Before starting her current job, O’Higgins was not familiar with ethanol. She did a lot of interviewing and learning, and has found the process so interesting that she is considering pursuing further education on environmental topics. Originally from Toronto, O’Higgins moved to Jamestown, North Dakota, for family, and found a passion in a job that allows her to make an impact on her community. O’Higgins enjoys the rural lifestyle, including hunting waterfowl and deer. Her love of the outdoors makes her job even more rewarding. “I feel like I’m doing my part to preserve the environment, especially as an avid fisher and hunter,” said O’Higgins. She also finds satisfaction in knowing that her company is another customer and source of income for local corn growers. Dakota AgEnergy uses a substantial amount of corn, and the company is able to benefit the economy. The community in Jamestown is small, and since people know where she works, O’Higgins gets lots of questions. “It gives me an opportunity to lobby ethanol, to educate the community and people who know me,” O’Higgins said. O’Higgins even posts on Instagram about ethanol now - “It’s something I go out of my way to share on my personal media,” she said. Between budgeting, administration and compliance, there is not much the executive director of an assisted living facility does not do. But Shannon Hundley always finds time to connect with the residents at Renaissance Village Rancho Belago in Moreno Valley, California, where he serves as executive director. 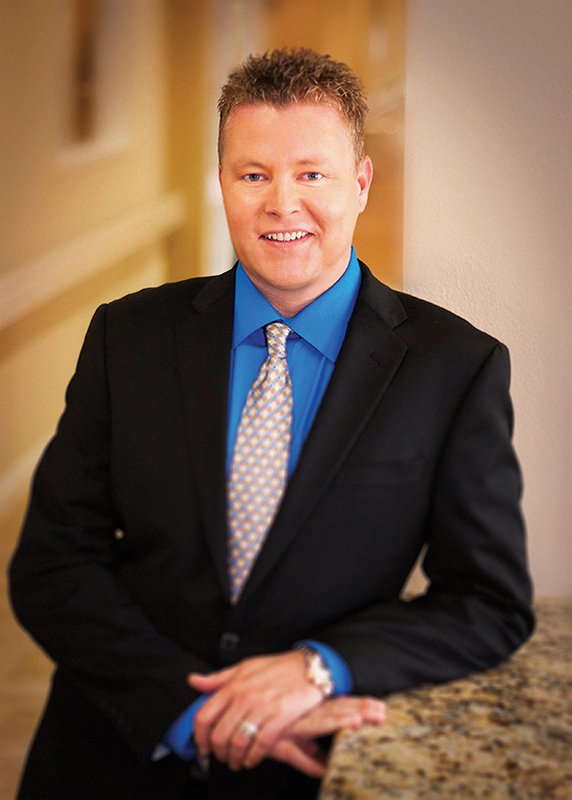 “I’ve always worked with the elderly in some form or fashion, from skilled work to in-home care, but assisted living has always been my passion and where I want to be,” Hundley told EB5 Investors Magazine. In fact, Hundley has made his entire career about serving the elderly, and has been at it since graduating high school. “When I graduated high school, the closest thing that I could get to by foot or by bike was a skilled nursing facility,” Hundley said. “I started working there in housekeeping, and I moved up through the dietary program and as a rehab aid.” Hundley also said that passion carried him through college at Wichita State in Kansas, where he earned a bachelor’s degree in healthcare administration and a minor in nursing in 2000. That commitment to serving his residents shines through when he spoke about meal time at Renaissance Village, where he is often making the rounds, greeting and catching up with residents. He stressed the importance of fostering a more social connection with the people living there. Meal time helps the residents feel like they are at “home,” Hundley said. That feeling of home also extends to the staff. His job is not only professionally satisfying, but also personally rewarding. Hundley also added that he feels a sense of pride in what he does, knowing that he makes a difference in people’s lives every day. When the right attitude meets the right opportunity and training, success often follows quickly. For some, very quickly. positions, but little formal on-the-job training hindered her advancement. That is, until she began her current job at a Burger King franchise in downtown Chicago, a location financed with EB-5 capital. 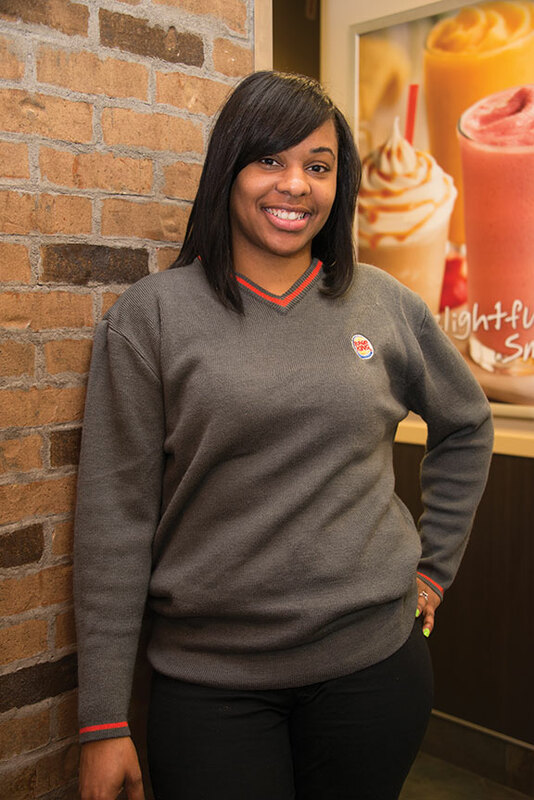 Murdock started as a cashier when the location opened, and within a few weeks she moved up to a shift manager position. Just a few months later, she was promoted to assistant manager. Her responsibilities now include scheduling, hiring, food safety and other restaurant needs. ”I love this job. And when I say I love it – I love it,” Murdock said. After trying other career paths, Murdock knew where she could be the most successful. Murdock is a prime example of someone with the skills to succeed in their profession, who was simply waiting on the right job and environment to thrive. Murdock also explained that taking this job has allowed her to cultivate her passion for customer service and for serving her fellow employees. She has even developed a few regular customers along the way. “We have this older woman who comes in every morning for a cup of coffee and orders a salad to-go for lunch later. When she comes in I already have her order ready,” she said. Customers like this regular can get a coffee anywhere in downtown Chicago, but she comes to Murdock’s Burger King instead. There is a certain sense of pride in that, Murdock said. Outside of work, Murdock maintains a busy schedule with her children. She stressed that this job has greatly improved her quality of life, giving her flexibility and control of her schedule to be with her family. On her off days or on weekends, if she is not working, Murdock is with her kids. “It really has given me an opportunity to advance my career,” she added. Murdock plans to go back to school soon. Like so many Americans, Murdock was not familiar with the EB-5 program and was not aware that EB-5 funds helped create her job. 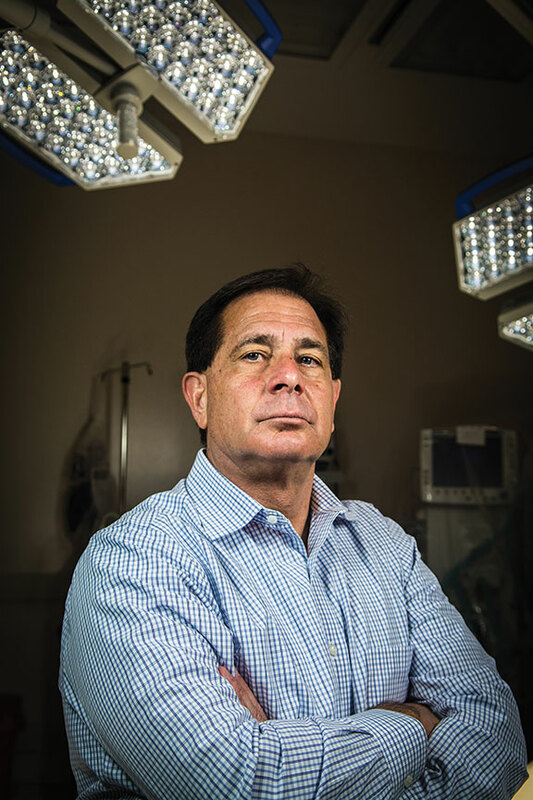 David Wanger has been running hospitals for 34 years. He started off as a single-day volunteer when he was a teenager, shadowing a family friend who was the director of a hospital. That day turned into an entire summer, and that summer blossomed into a career. Growing up, Wanger’s father pushed him into the field, albeit in a roundabout fashion. Wanger’s career has taken him to hospitals across the country in several different capacities. Currently he is the executive director of Green Valley Hospital in Green Valley, Arizona, an EB-5 project developed by the locally-based Green Card Fund. “I came to Green Valley about 16 months ago and essentially what I heard from everybody was that they were in constant need of a hospital,” Wanger said. Green Valley residents were travelling 45 minutes to an hour to Tucson to get the care they needed, spending an average of $350 million in gross charges every year, Wanger said. The Green Valley demographic, which has an average age of 71, needed a much closer option than Tucson. Wanger’s passion for running hospitals starts with giving people the care that they deserve, he said. That itself must begin with his way of doing things. Getting the hospital running by himself allowed Wanger to create a unique culture. Rather than grappling with an existing way of doing things, he got to start from scratch. The most important thing for him, he said, was seeing the community’s reaction to finally having a place to get the care they need. That is a testament to the Green Valley community, which surprises him every day with their enthusiasm, Wanger said. 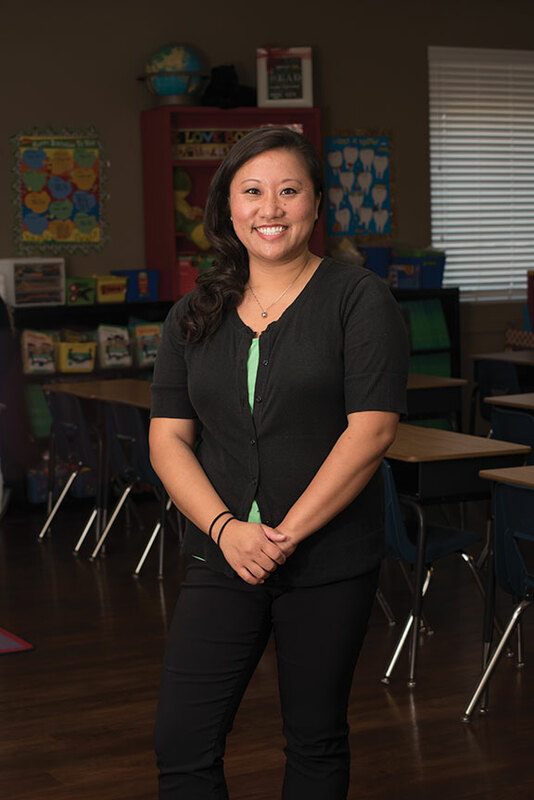 For Makayla Gesualdo, teaching in the classroom is where she always wanted to be. Last year she taught third grade. This year she became the instructional coach, the assistant to the principal, and also serves as the curriculum director at Learning Foundation and Performing Arts Charter School. Gesualdo has been teaching for 10 years, and has been at Learning Foundation and Performing Arts for almost three years. This is her first year at the charter school’s Warner campus, which has a unique dual focus on academics and the performing arts. Gesualdo herself is no stranger to the performing arts. When she was younger, from kindergarten to high school, she was in competitive dance classes, so she can relate to a lot of the students at the school. Working in a school that is not just focused on academics has been personally rewarding, she said. “I think the greatest thing is that we have kids at the school who love to sing, who love to perform, and to act. To incorporate that into our classroom, and into all of our academics, is great for the kids,” says Gesualdo. “The two really go hand-in-hand,” she added. Before her current position, Gesualdo taught at traditional public schools in the Midwest, then came out to Arizona to teach at another charter school. Gesualdo was contacted by a mother who was considering moving her daughter to Learning Foundations because she excelled in dance and the mother thought it was important for her to broaden her horizons. They suggested that Gesualdo check out the school and see if she would be interested in moving over. She feels that being able to combine those passions for the performing arts and teaching has helped her grow as a teacher. Gesualdo also appreciates the opportunity that the school offers to its students. She was a shy, reserved student, and now knows that if she had been given this opportunity in her school it would have helped her overcome many obstacles. The job has been rewarding not only professionally, but also personally, she said. Robert Doyle is a man who loves his job. He knows it, and he wants everyone else to know it, too. He has also seen most of the world, all without leaving New York City. Doyle has been in the car and driver service industry, in one capacity or another, for 36 years. 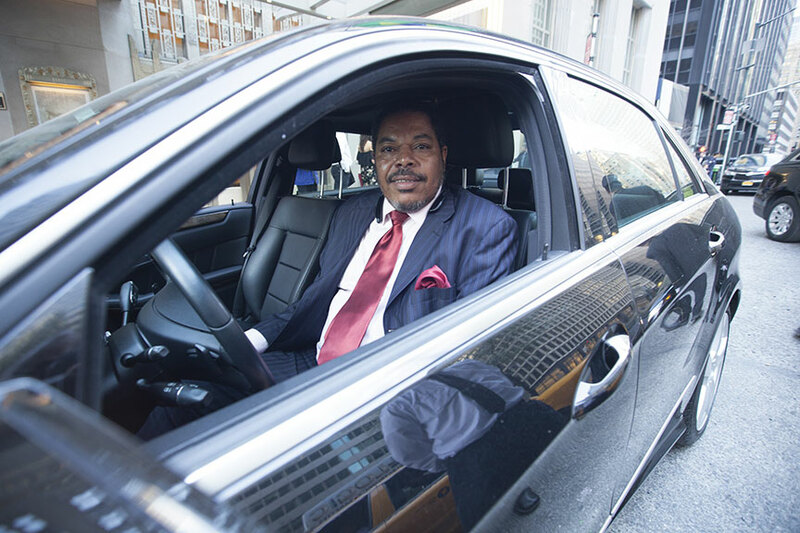 Doyle now works for La Puma Car and Limousine Service as their operations manager. La Puma is a subsidiary of NuRide, which recently used EB-5 capital to expand its business, and they brought Doyle in specifically for his current position. That guest interaction leaves him with a feeling of satisfaction that, at the end of the day, even he cannot describe. “I come home and talk to my wife and my children and my grandchildren, and I try to explain to them why I come home with this feeling that money can’t buy,” Doyle said. That rapport is important from a business and financial perspective, Doyle noted, but it also enhances his personal life in ways that can’t be measured with profit margins. He noted that the sense of satisfaction he gets from helping someone get to where they are going is what drives him the most. “I could do this every day for the rest of my life,” he said. When she retired from the U.S. Navy after 20 years of service, Yolanda Ellis knew that she wanted to continue to serve. Although now, rather than serving her country, she is serving the residents of Lakewest Assisted Living in Dallas, Texas. Even though it was an abrupt career turn, “it was the right decision,” Ellis said. Ellis quickly discovered that she indeed had a passion for the culinary industry. In the Navy she learned basic food principles and techniques, how to read recipes, and how to manage a kitchen—albeit a very cramped one on an aircraft carrier. “I definitely started from the bottom learning how to cook and read recipes,” she added. After a two decade career in the Navy, Ellis retired and settled in Virginia while her husband was still active-duty. There, she worked as the congregate nutrition site manager for Senior Services of Southeastern Virginia, a local non-profit. 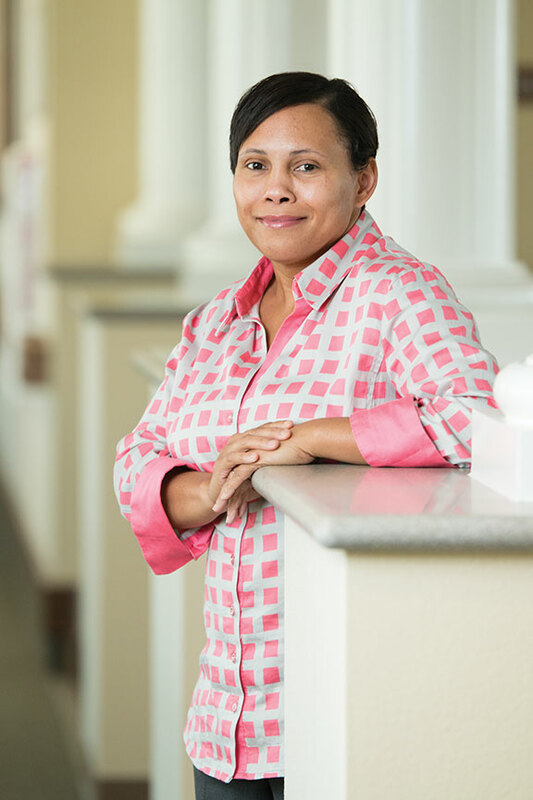 “When my husband and I relocated to Texas, I already knew that I had a passion for food, but when I took the position [at SSSA], I was able to work with the senior population, and I realized that that was another passion of mine as well,” Ellis said. Ellis said she wanted to combine her passion for food and her passion for customer service and serving the elderly. “I realized that those two things together were something that I wanted to do, so when I moved to Texas, I started looking for jobs in nursing homes that could combine both of my passions,” Ellis said. Ellis found Lakewest Assisted Living in Dallas in March 2015. Lakewest is operated by Stonegate Senior Living LLC, which utilized EB-5 financing to finance Lakewest’s construction. She stressed that her interaction with Lakewest’s residents is something that drives her to do her best every day. Ellis is more than just a meal planner or dietary specialist. She tries every day to connect with the residents and make sure all their dietary needs are met. Ellis also said that she gets that same satisfaction by providing nutritious meals for and interacting with the residents of Lakewest, and is grateful that she has found a career after the Navy that allows her to do just that. Just like when she joined the Navy more than 20 years ago, Ellis’ move to the senior assisted living industry is not without its set of challenges. The dietary restriction learning curve has been a steep one, but she is up for it. The work-life balance she has now is a luxury that Ellis fully enjoys, which enables her to be home every night for family dinner with her son. Ellis is also headed back to school - she already has her associate degree, but now she is pursuing another associate degree in dietetics. The job is going to provide her with the extra credits that she needs to complete the degree. “This job has given me the opportunity to give back and combine my two passions,” Ellis said. Relocating as a refugee can be a traumatizing and dramatic experience. When moving to the United States, refugees often face cultural and linguistic barriers that can hinder their acclimation to the American lifestyle. Like anyone else, refugees must find employment once they settle here. Resettled refugees are authorized to work in the United States by the Department of Homeland Security, and many look forward to the employment opportunities offered by their new host country. Despite hardships, Lian Khan Nang has dedicated himself to advancing his career and building a life in the United States. That is exactly what Nang did when he resettled in Portland, Oregon as a Burmese refugee in 2012. “Life in Burma is hard, especially where I was,” Nang said. When he resettled in Portland, Nang went to school at Mt. Hood Community College to earn an accountant assistant certificate. But after months of looking for work, he couldn’t find anything. That is when he found his current job at the Pearl District Marriott Hotel in Portland. Lian initially applied to the front desk when the hotel opened in 2014, but he was offered a job in the food and beverage division as a breakfast attendant instead. “When I first started working food and beverage, I didn’t know anything about it,” Nang said. After a few weeks of training and another couple of months on the job, he grew to love it. Nang was recently promoted to food and beverage lead. He carries much more responsibility now, and he could not be happier about his career prospects. 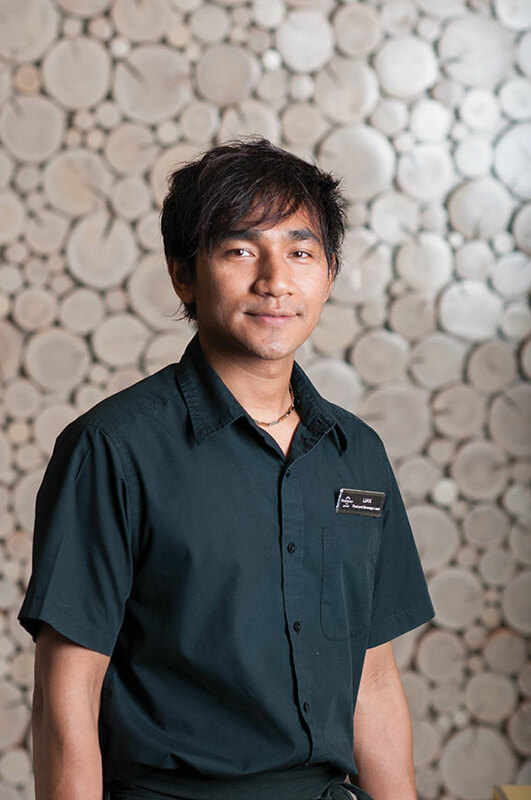 Since he started working at the Pearl District Marriott, Nang has regained a sense of normalcy in his life, and he has plans to further his education to take his career to the next level. Nang noted the differences between his life since settling in the Pacific Northwest with his relatives and the totalitarian regime oppressing his home country. Those differences may seem complicated by the years of internal conflict in Myanmar, but to him, the simple opportunity to work in the United States has drastically changed his life.